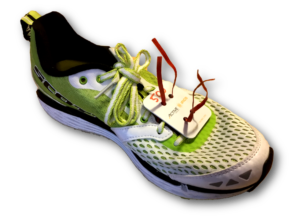 Reusable Chip Shoe Tags-provided to the runners when they pick up their packets, preferably at minimum 1 day before the event. Participants, at that time, are then provided “education” on how to properly wear the tag and return it after the event. This would include oral and written instructions. Disposable Chip Vinyl Bib Tags are attached to the back of the participants Bib number by the Timer. Education is provided to the individual on how to handle the bibs pre-race to promote a successful read as they cross the finish line.